Fort Hall Business Council member Lee Juan Tyler talks about traditional male roles. FORT HALL — The Victim’s Assistance Program hosted a Domestic Abuse Cultural awareness event October 25 to educate those working in Domestic Violence organizations, also for community members, and anyone else who was interested in understanding working with the Native American community. To start off the day was a prayer by Jason Butler, followed by words of encouragement from Miss Sho-Ban Sequoia Pahvitse, and a welcome from the VAP director Audrey Jim, as well as Fort Hall Business Council member Donna Thompson, who said it is important to identify and be aware, when domestic abuse is happening. THHS Director Ann Lindroth Jim, welcomed all, and also provided statistics for domestic violence in the Native American community. 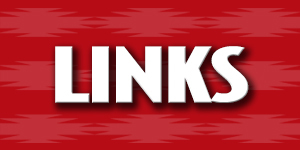 Lindroth Jim says, “Native American women will experience violence at rates of 50 percent higher than any other race.” Up to 10 million children in the Native American community will witness some form of violence, annually. She said when people who go through domestic violence, they need to let people know that something is happening to them, because it may one day save their lives. She listed all of the departments that one can utilize the services. She would like to see more programs become available and/or additional services to teach young people about everyday living, such as teaching about finances, and even relationships. She said many do not know what is expected of a young adult, and would like to teach them about these things and provide services. Matthew West presented on Cultural Competency. He is tired of seeing people put a “band aid” on domestic violence, he wants to see more done. He said there are not many programs that are cultural competent — many of the participants were from programs from Blackfoot, Pocatello, and other local areas. 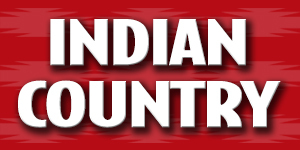 West identified all the different cultures in South East Idaho, and encourages all to learn as much as they can while working in their specific fields. He asked all “what is cultural competency? It is congruent behaviors, that make you aware of, and to make it easier to work with. You are looking at a culture of a people, that belief of a people and then you take the ability to recognize that, and put it in your program and become proficient and effective in using a person’s culture.” He said anyone who has to work with different cultures as well as Native people should learn some things, to be culturally sensitive and helpful when working with each particular culture. Participants should know and learn somewhat of a background on the people you are working with. He talked about the Shoshone Bannock Tribes, and how fortunate the Tribes in Fort Hall are a truly blessed people adding many forces are out there who want to see the Tribes fail, but many working for the Tribes are working to make sure it does not happen. West said all the departments within the Tribes, are very accurate in working with cultural competency. He ended with saying we all need to think outside the box, and to recognize that we all need to work together to be efficient, and to provide excellent services to all the people of different cultures. He also commended the Tribes for creating a domestic abuse ordinance, which has been in place since 2006.
at the Domestic Abuse Cultural Awareness event. 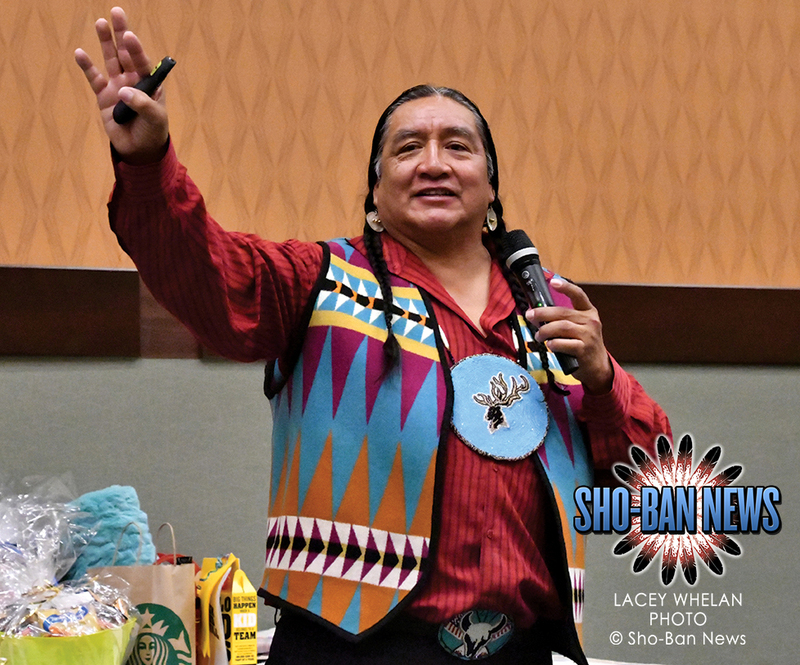 Tribal Council Member Lee Juan Tyler presented on the men’s traditional role with a slideshow while telling about the ceremonies and events he was involved in and what men were expected to participate in. He also said the men were supposed to raise and teach their sons about respecting women, and always have respect for them. The men’s role was to make sacrifices for women and children. The men’s role also was to get along with other men to promote good well being. Years ago before alcohol came around, there was not abuse towards women. He believes that alcohol has played a big role in the abuse of women and children. Tyler gave a small history of the Shoshone and Bannock people, and showed appreciation for his ancestors. Denise Peshlakai, BS MSW talked about domestic abuse as a part of historical to current changes in Native Teachings. She started off with statistics and the history of the Native people. She said domestic violence is a learned behavior, batterers learn through observation of others, family members or friends. She explained men and women are victimized at similar rates in different ways. They have experienced similar levels of psychological aggression and physical violence by intimate partners. Native women experience higher levels of sexual violence. Victimization rates are higher for Native and Alaskan Native women. American Indian and Alaska female victims are more likely to need services but less likely to have access to medical and legal services. During a physical assault native women were more likely to be injured and require medical care, furthermore, persons not of the same race commit 70 percent of violent victimizations experienced by Native American women. Most incidents of violence are not reported due to the belief nothing will be done. Peshlakai mentions the importance of teaching traditional practices to the younger generations, teach them life is not a competition, nor do we practice violence towards others. 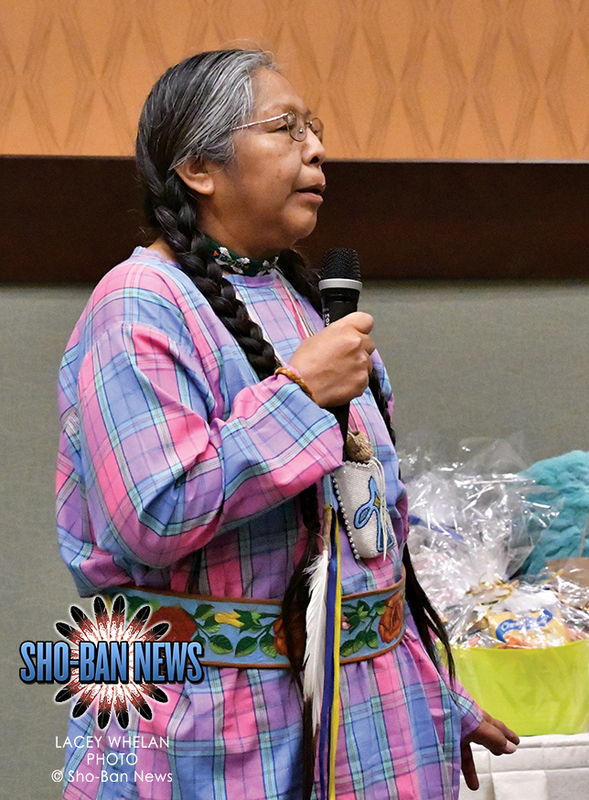 She believes that teaching respect and compassion for others, and to show the value of women in tribal society, and by supporting all tribal members, it will make for a positive guide for all of the community. Charlene Wahtomy spoke on women’s traditional roles, and also recounts her personal experience with domestic violence. She remembers her father who was a WWII veteran, was the one who helped her with the trauma she went through. They would often go on walks in the mountains, and would share their stories and feelings. She also said there are not many men in the household anymore, it has been the women who have to step in and raise the children as the mother and the father to become the main caregiver. After lunch, Louise Dixey, Tribal Language and Cultural Resource director educated the participants about the history and culture of the Tribes. She tells the participants we still practice cultural events from years ago and the importance of the events. She explained how extremely important it is to keep practicing our language, and the importance of teaching the children at a young age, so the language will stick with them. She showed photos of all the cultural events from this past year, as well as the classes they have hosted for the community. She explained how the Sho-Ban Tribes use the Fort Bridger Treaty everyday, and the importance of it. Dixey ended her portion of the event by reading a poem to everyone. 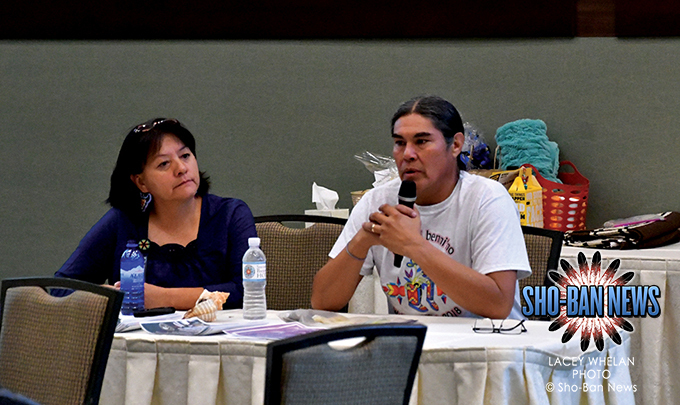 Kermit and Annie Bacon speak about spiritual healing through Native practices. Kermit and Annie Bacon educated all on healing domestic abuse through the ways of sweat lodge and Native American Church. They just returned from an 80 mile relay run, and remind all that exercise also can help with the negative aspects in life and creates an endorphin rush that helps many heal. They both shared with everyone they grew up in homes with domestic abuse and said they tried to keep close with the positive influence people in their families. They provided a slide show, which showed different spiritual methods they use, as well as the importance of burning cedar and sweet grass. A volunteer walked among the crowd to show how the items look. They remind the participants, how important it is to practice traditional ways of healing and said different families and programs in Fort Hall use them as well. After the speakers were finished, TBC Member Lee Juan Tyler thanked all the participants for coming. All the participants were asked to participate in a round dance, and the group finished the day by giving out door prizes, provided by the Victims Assistance program.